With the year’s biggest football game just over a week away, I thought it might a good time to start sharing some game day recipes. One of our favorites for game day, or any day really, is this delicious Turnip Green Dip. Turnip greens, you say? In dip? For real. Just think of the classic spinach dip with a Southern accent. I had a little over half a dish of this in the fridge when BeeBop’s brother, Uncle J, stopped by one afternoon this week. I heated it up in the microwave and he and I nearly polished it off while we were waiting for BeeBop to get home from work. I think he will attest to its deliciousness. To start, you’ll need to cook your frozen chopped turnip greens according to the package directions, omitting salt. Put them in a colander and let them drain well until you need them later in the recipe. Cut three slices of thick cut bacon crosswise into little slices, or lardon. Cook the bacon in a large, deep pan or Dutch oven over medium heat for 5 to 6 minutes or until crisp. Remove the bacon to a paper-towel lined plate to drain. Discard all but one tablespoon of the bacon drippings, leaving it in the pan. To the hot drippings, add the onion and garlic and sauté for about 4 minutes or until onions begin to appear translucent. Add the wine and cook an additional 2 minutes while stirring to loosen any particles from the bottom of the pan. Stir in the cooked, well-drained turnip greens, cream cheese, sour cream, red pepper flakes, salt, ground pepper and ½ cup of the Parmesan cheese. Cook, stirring frequently until the cream cheese is completely melted and the mixture is heated through, about 6-7 minutes. Transfer the mixture to a lightly greased 8×8 baking dish. Sprinkle the top with the remaining ¼ cup Parmesan cheese. Broil for 4 to 5 minutes or until the Parmesan cheese is very lightly browned. Remove from the oven and sprinkle with the reserved bacon. Serve with assorted crackers and tortilla chips. A warm dip with all the fantastic flavors of turnip greens, bacon, onion, and cream cheese. Cook the turnip greens according to package directions, omitting salt. Drain well and set aside. Cook the bacon in a large, deep pan or Dutch oven over medium heat for 5 to 6 minutes or until crisp. Remove the bacon to a paper-towel lined plate to drain. Discard all but one tablespoon of the bacon drippings, leaving it in the pan. To the hot drippings, add the onion and garlic and sauté for about 4 minutes or until onions begin to appear translucent. Add the wine and cook an additional 2 minutes while stirring to loosen any particles from the bottom of the pan. Stir in the cooked, well-drained turnip greens, cream cheese, sour cream, red pepper flakes, salt, ground pepper and 1/2 cup of the Parmesan cheese. Cook, stirring frequently until the cream cheese is completely melted and the mixture is heated through, about 6-7 minutes. Transfer the mixture to a lightly greased 8x8 baking dish. Sprinkle the top with the remaining 1/4 cup Parmesan cheese. Broil for 4 to 5 minutes or until the Parmesan cheese is very lightly browned. Remove from the oven and sprinkle with the reserved bacon. Serve with assorted crackers and tortilla chips. If you try it, I’d love to know how it goes over. It’s always a big hit here. I love how this incorporates a different kind of green. Such a great idea! Perfect game food for sure. Been a bit “under the weather”, but that looks like just the warm and comfy dip to make things all better. How about serving it with sweet potato chips, for a southern flare? I must have a clogged brain from all of the medicine! A southern “flare” would involve some sort of igniting element. Not exactly what I meant. Try a southern “flair”. Sorry. So sorry you haven’t been well. Hope you’re all better now? Hmm. Sweet potato chips might be perfect with this! Thanks for the idea, P.
Not sure I　ever had turnip greens before…the dips looks absolutely comforting and tasty! Never had turnip greens? I truly cannot imagine that. I was laughing when I read the recipe and you said to “cook your frozen chopped turnip greens”… because I honestly didn’t know they even made them!!! Seriously, I have never seen them here in California – I think we need to start a campaign to STOP the discrimination against turnip greens!!! Just another example that I live in a culinary backwater!!! This dip sounds perfect for game day but I probably have to make my own turnip greens!! Seriously? And I’m quite sure I’ve never been a grocery store in my adult life that didn’t have them :-) And if you want to make the dip, yes, do cook your own turnip greens by all means. It would probably be even better. The frozen ones are just a simple shortcut. I’ve never seen them at the store, either! This recipe looks so good though, and I always love trying new greens. Perfect for game day! I have never cooked with turnip greens before, but boy does this dip look delicious! Oh yum yum yum!! 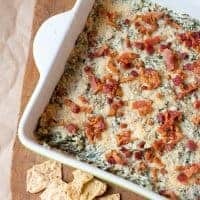 I love spinach dip and this looks like an amazing take on it. I may have to sub spinach for the turnip greens in fact, but one way or another I’ll be making this soon! If you can, please do try the turnips. I think you’d really like it! Looks delicious! I never had turnip green dip before. But this time I should give this a try. This is such an irresistible dish! Thanks for having this post.